ACCREDITED 4 STAR! Welcome to Koroit's Birch House, a circa1880's cottage which has been lovingly maintained and sympathetically restored to reflect a bygone era with all the conveniences of a modern home. Birch House also has a mud brick unit, 'Birch studio', nestled in the extensive private gardens. This luxurious couple accommodation is fully self contained, has a queen bed, a brand new timber & stone fully equipped kitchen, cathedral ceilings and a wood fire. It has a charm and character all of its own. With garden furniture settings on the lawns in the shadows of the enormous trees, this makes a tranquil relaxing setting for a romantic getaway. The gardens have an array of different types of plants and trees attracting an abundance of birdlife. Koalas also visit the huge gum trees in the garden on a regular basis. Just a few minutes stroll to the main street of historic, quaint Koroit, you can enjoy renowned restaurants, pubs and cafés. Explore Tower Hill Game Reserve, the Heritage Trail, Koroit Art Gallery, Botanical Gardens, the Port Fairy-Warrnambool Rail Trail, historic Tower Hill Cemetery, or visit Killarney Beach. It's all at your doorstep! With mountain bikes provided for your use, take a ride around the town. It is a perfect way to discover the charm of this interestingly historic, picturesque town of Koroit. 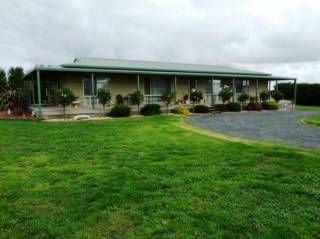 Birch House and Birch Studio are available to be booked together to enable 8 people to stay at the one property, providing fully self contained luxury accommodation in the heart of Koroit. We hope to see you soon. For a list of attractions in Koroit and surrounding areas, please view our 'Activities' page on our website. Due to extensive birdlife and wildlife, sorry, we cannot allow pets, however Koroit has a local pet resort to cater for your pets. A full list of activities and attractions is provided on our website to help you plan your trip! Tower Hill (an extinct volcano) is on our doorstep - Victoria's first declared Game Park (National Park). You can drive or walk right through the crater! Meet lots of emus, kangaroos, koalas and lots more! Beautiful beaches, great fishing spots, beautiful drives, great walks (or rides on the cycles). Warrnambool has an enormous amount to offer, as does Port Fairy - both just 10 mins drive! Cancellations - Up to 14 days prior to arrival - deposit MAY be refunded at the owner's discretion (less a $50 Administrative Charge). Cancellations received 0-14 days prior to arrival - 100% of amount paid is forfeited. Check in is from 3pm. Upon final payment for your booking, you will be issued with a code to retrieve your key from the security key safe on site. 50 % Deposit required by Visa or Mastercard. Balance payable 14 days prior to arrival. Valid Credit Card held as Bond. Cancellation 14days or more before arrival incurs a $50 cancellation fee. Cancellation less than 14 days prior to arrival - refund of Deposit (less $50 cancellation fee) ONLY if property is able to be re-let to another party. Children of all ages are welcome at Birch House. With 2 single beds, a portacot (for an additional hire charge of $15 per booking - includes all linen and doona fully laundered each stay), high chair and baby bath are all provided for your use. Extensive fenced gardens provide plenty of outdoor play area. Unfortunately "Birch Studio" does not cater for children. There are no additional charges for extra guests. The Birch House caters for up to 6 people and Birch Studio caters for 2 adults.